Professor Rodney S. Ruoff has been selected for the James C. McGroddy Prize for New Materials by the American Physical Society. Rodney S. Ruoff, Distinguished Professor at the Ulsan National Institute of Science and Technology (UNIST) and Director of the Institute for Basic Science Center for Multidimensional Carbon Materials (IBS-CMCM), has been awarded the James C. McGroddy Prize for New Materials by the American Physical Society (APS). 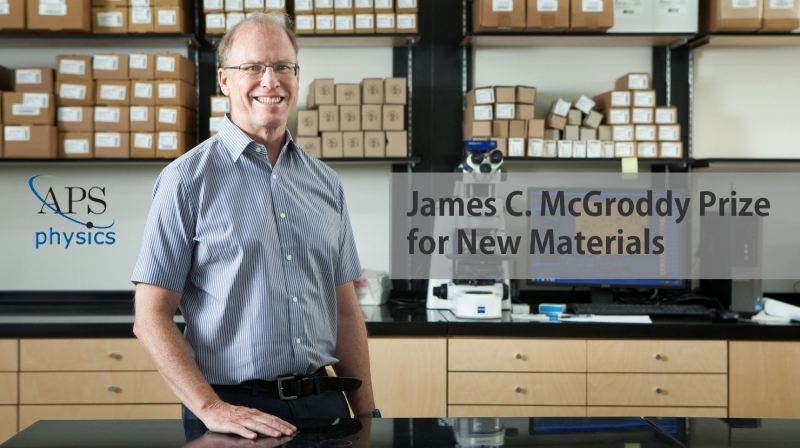 The James C. McGroddy Prize for New Materials is an internationally prestigious award that has been awarded annually by the American Physical Society since 1997. Its aim is to recognize and encourage outstanding achievement in the science and applications of new materials. The prize consists of $10,000 plus a certificate citing the contribution of the recipient and an allowance for travel to the meeting of the Society at which the award is presented. Professor Ruoff and his research team first published on graphene in 1999 in two peer-reviewed articles, one in the Journal of Applied Physics and the other in the journal Nanotechnology. Since then, he and coauthors have published many peer-reviewed articles in a variety of scientific journals on pioneering discoveries about graphene and derivatives such as graphene oxide. Google Citations notes that Ruoff’s publications have been cited over 141,000 times; five of his papers have been cited more than 5000 times, and twenty-five have been cited over 1000 times. Ruoff is considered by many to be the most prolific researcher in the World for the widest range of scientific discoveries on graphene and graphene derivatives; and his published research is also considered to be the most impactful in ‘driving’ the exploding worldwide research and development of graphene and graphene derivatives such as graphene oxide, reduced graphene oxide, functionalized graphene, graphene grown on metal foils by chemical vapor deposition, and so on. In addition to being author or coauthor of 470 peer-reviewed scientific publications, Ruoff is also an inventor or co-inventor on 43 patents. Rodey S. Ruoff received a Bachelor of Science degree with high honors from The University of Texas at Austin in 1981 (in Chemistry), and a Ph.D. from the University of Illinois at Urbana in Chemical Physics in 1988. Prior to joining UNIST in January, 2014, he was Cockrell Family Regents Chair Professor at UT-Austin (2007-2013) and John Evans Chair Professor at Northwestern University (2000-2007). He directs the Center for Multidimensional Carbon Materials, an IBS Center located at the UNIST campus in Ulsan, South Korea, that currently has over 100 student and professional researchers making and studying new carbon and related materials. The APS James C. McGroddy Prize will be presented to Professor Ruoff at the 2018 Spring Meeting of the American Physical Society to be held in Los Angeles, California, USA on March 5-9, 2018. He will be also presenting an award lecture at this scientific meeting.